3 Questions About Whitening For Your Cosmetic Dentist in Revere! Everyone can agree that a beautiful smile is a good thing! Not only do you feel more confident and sure of yourself with a healthy set of pearly-whites, but studies have shown that other people perceive you as more intelligent and attractive as well. Talk about a win-win situation! But if you don’t feel so great about your smile, what’s a quick, easy way to transform it? Two words: teeth whitening! 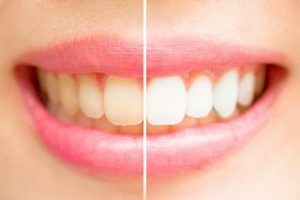 As any cosmetic dentist in Revere will tell you, whitening is an excellent way to get big results with a minimal investment of time and money. So, what are some of the questions you should ask when you’re considering this popular cosmetic treatment? Keep reading to find out! This is one of the first questions you should ask yourself before you have a consultation with a cosmetic dentist. Summertime is a busy season and many people want to brighten their smile before attending special events like weddings, vacations and reunions. If you want to whiten for an upcoming event, chances are you want your results as soon as possible! The good news is that there are professional treatments that can give you up to 10 shades whiter teeth in about an hour. There are several options for whitening, but they’re not all created equal! Professional take-home trays – This option takes at least two weeks of wearing custom-made trays filled with professional-strength whitening gel each day. Some patients find the trays uncomfortable or inconvenient and struggle to comply with the instructions. Unfortunately, this can make it hard to get the results they’re after. ZOOM! – This option is the fastest and delivers dramatic results (up to 10 shades whiter) in about an hour. A dentist in Revere will apply whitening gel to the teeth before using a special light to accelerate the process. You’ll get fast, long-lasting results, and since you’ll be monitored throughout the process, you won’t have sensitivity! Over-the-counter products – Whitening toothpastes and strips are less expensive than professional products, but also much less effective! Oftentimes patients are disappointed with the results and end up coming in for a professional treatment afterward. The best way to determine if you’re a good candidate for whitening is to schedule a consultation with a cosmetic dentist for teeth whitening in Revere. Most patients have stains that respond well to whitening treatments, such as those from coffee, tea, red wine, berries, tomato sauce and turmeric. However, if you have severe stain from fluorosis or tetracycline use in childhood, or have gum disease or extensive enamel wear, a dentist may recommend a different treatment. Rest assured, however, that there are great cosmetic options for every patient. After a consultation, you’ll have a better idea of how you can get your best smile – just in time for summer! Dr. Howard Brooks is a general, restorative and cosmetic dentist who loves seeing the results his patients get after whitening. He knows that a great smile has a huge impact on overall quality of life and has found that whitening is one of the most common cosmetic procedures he does because it’s fast, easy and effective. If you have any questions, he can be reached via his website or at (617) 846-1811. Comments Off on 3 Questions About Whitening For Your Cosmetic Dentist in Revere!